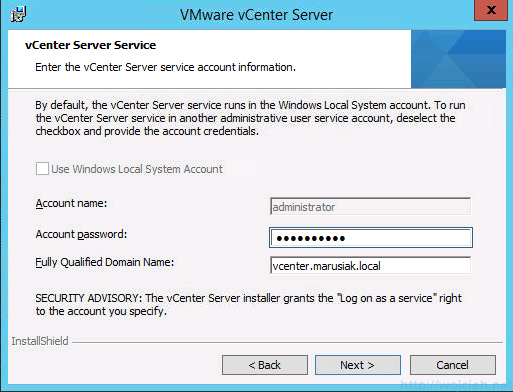 In last post, I will cover installation of vCenter Server on Windows Server 2012 R2 with SQL Server 2014. 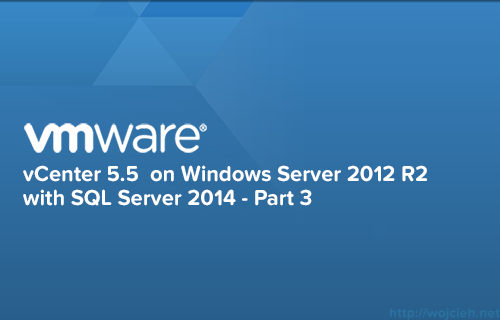 To recap – we installed SQL Server 2014, we created vCenter Server Database and we created ODBC connectivity. Insert ISO into your server and start the installer. 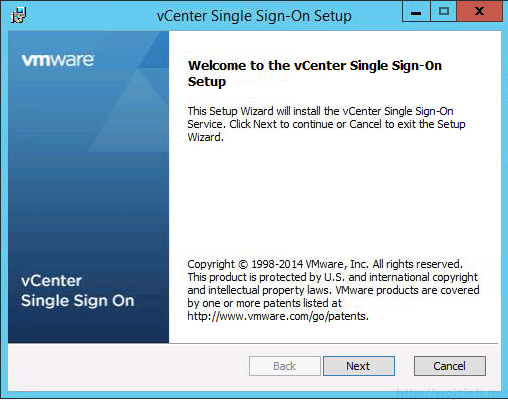 Select Custom Install and start with vCenter Single Sign-On installation. 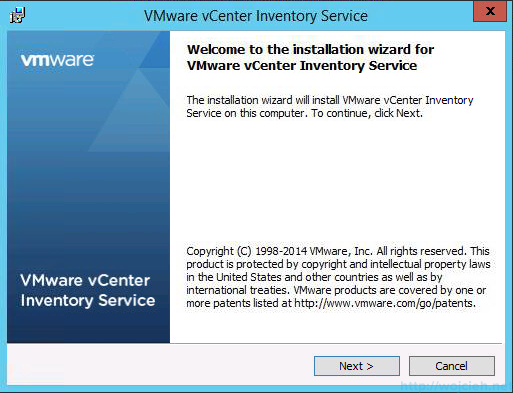 Click Install and then Next. On the next screen, you will see vCenter Single Sign-On Prerequisites Check where you see all details and click Next. On the next screen, you will see three options to select from. 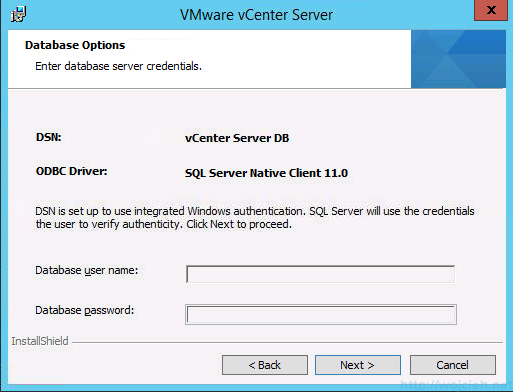 Provide SSO password and click Next. 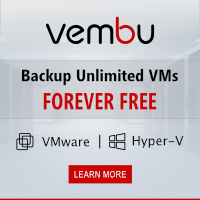 Provide Site name. I selected default one. I didn’t change SSO port. If you want to change it you can do it here. Provide path where do you want to have vCenter Server binaries installed. I selected dedicated disk to avoid filling it up with Operating System files. 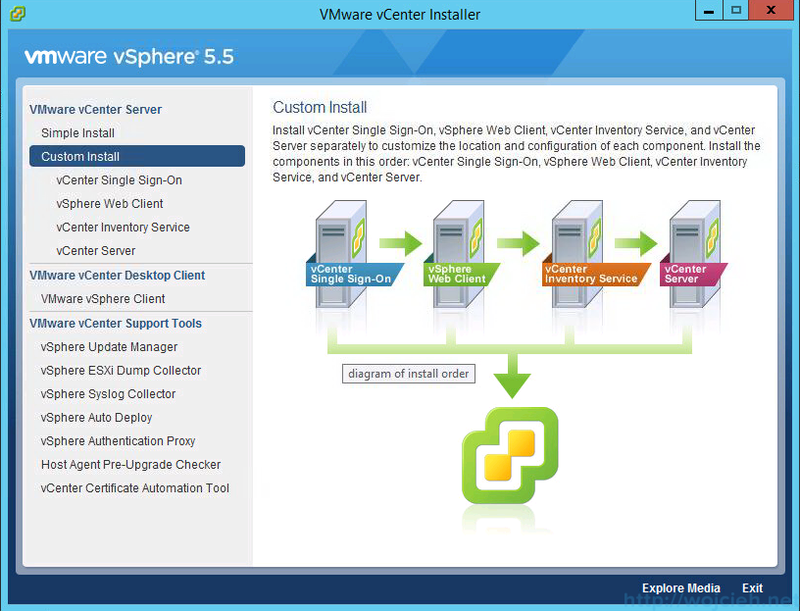 On the last screen, we will see the summary of SSO installation. Click the install button and follow installer. Click next and continue to next screen. Install Web Client into default directory. 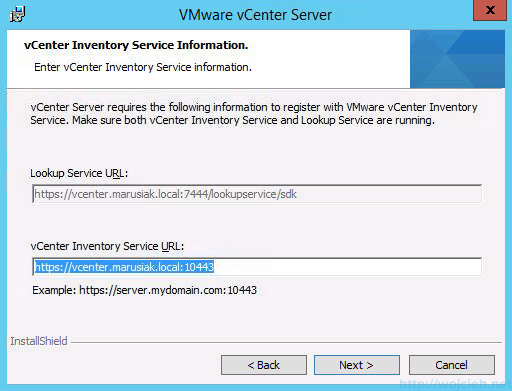 If you will select different directory than default one you will receive HTTP Error 404. 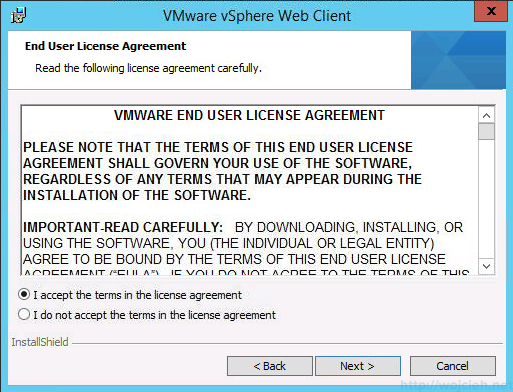 There is VMware KB which describes issue in depth: kb.vmware.com/kb/2044953. Provide Single Sign-On credentials and click Next. 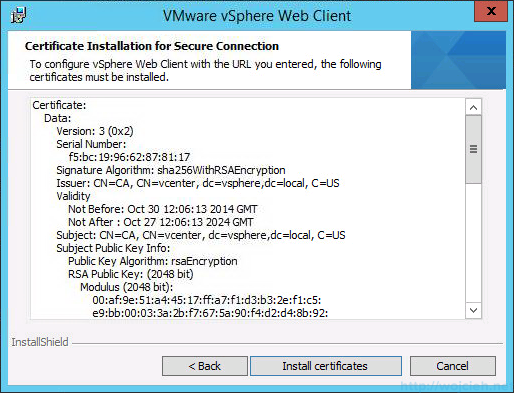 Accept SSL SHA1 fingerprint and click Next. Click install and wait for it to finish. 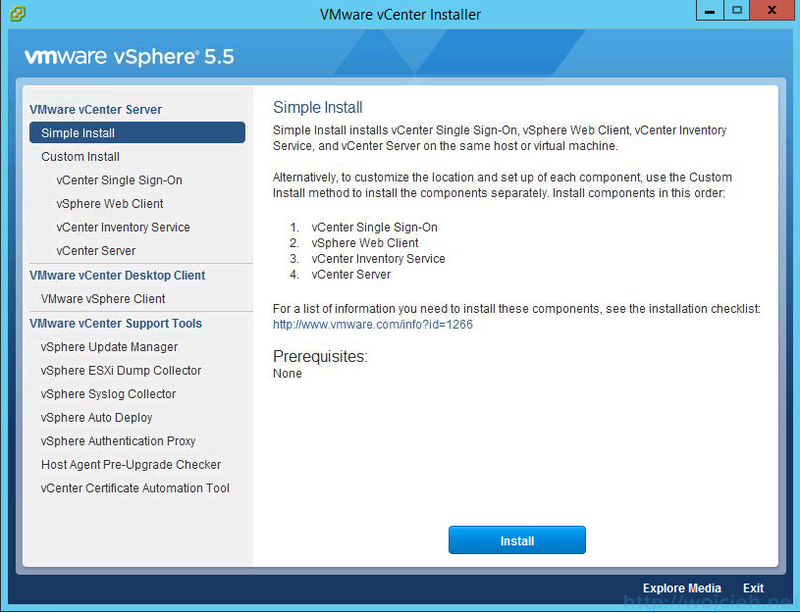 Start installer and select language to install. Click Next and proceed with the installation. 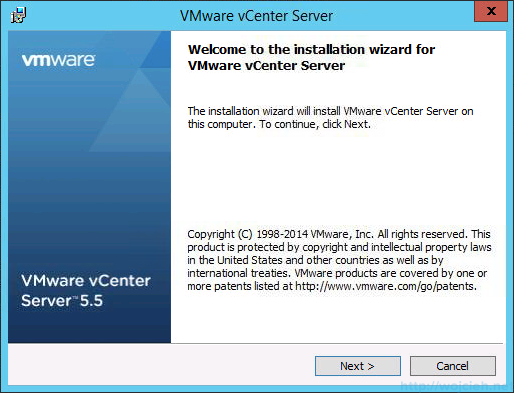 Change destination of binaries to be installed. Enter the domain name of vCenter Inventory Service local system. Provide ports for vCenter Inventory Service. Select inventory size to adjust JVM Memory settings. Insert Single Sign On credentials and click Next. Accept SSL SHA1 fingerprint and click Yes. 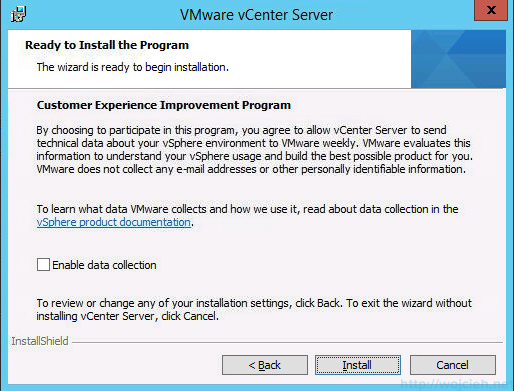 Select install and wait for Installer to appear. 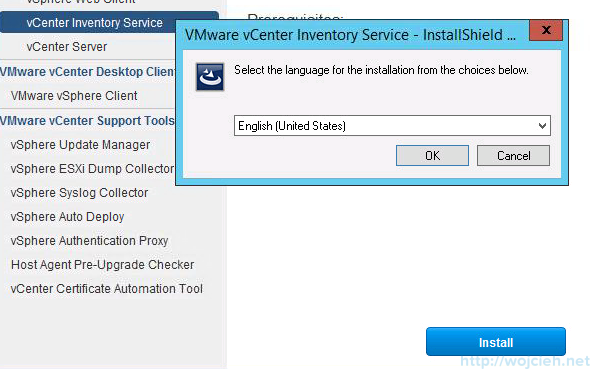 Select language to install and click OK.
Click Next and proceed to next screen. 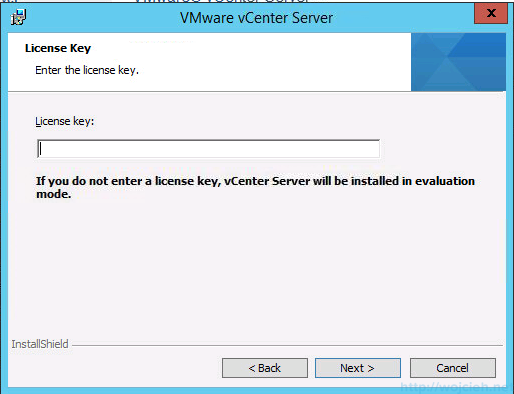 Provide vCenter Server key or skip it to be installed in evaluation mode. 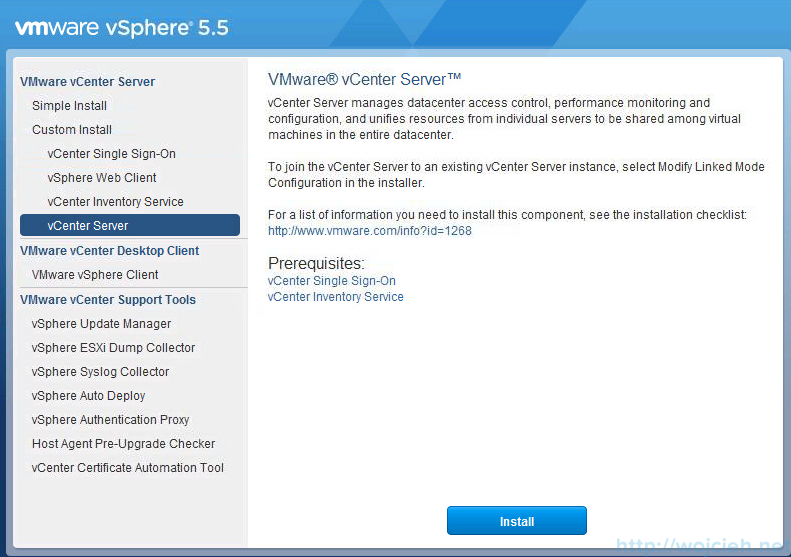 Select vCenter Server Database which was installed earlier. We selected during Database creation to use Full recovery model and this is why we received this warning screen. Provide local administrator credentials and click next. 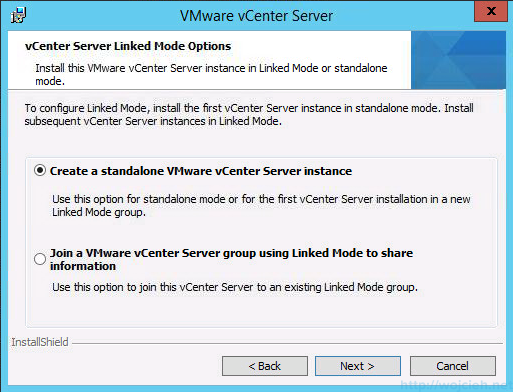 If you want to install vCenter Server in linked mode select it here. 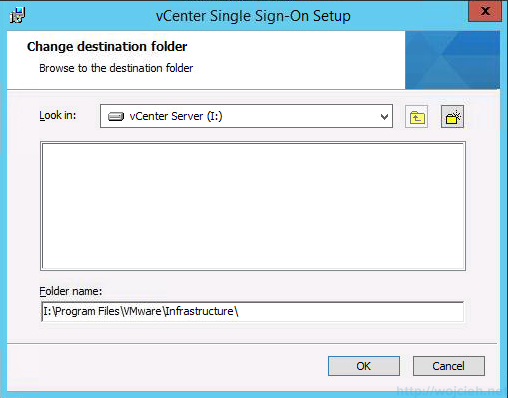 Otherwise, select Create a standalone VMware vCenter Server instance. 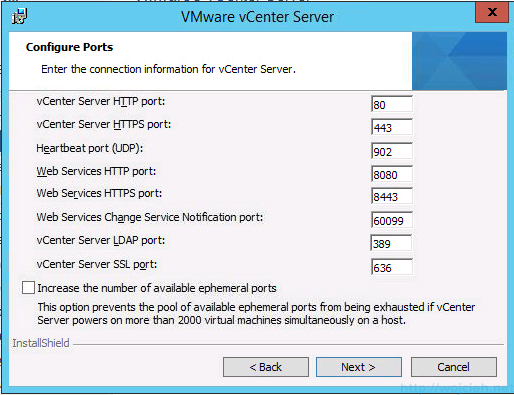 Change ports configuration if needed. 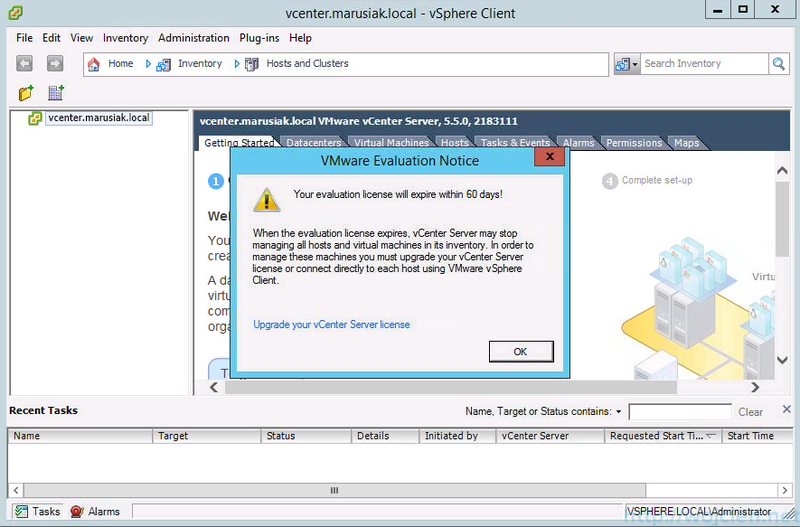 Select right size of your environment to correctly setup Java JVM for vCenter Server. 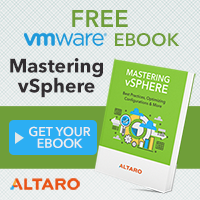 Enter SSO credentials and click Next. Register vCenter Single Sign-On administrator. 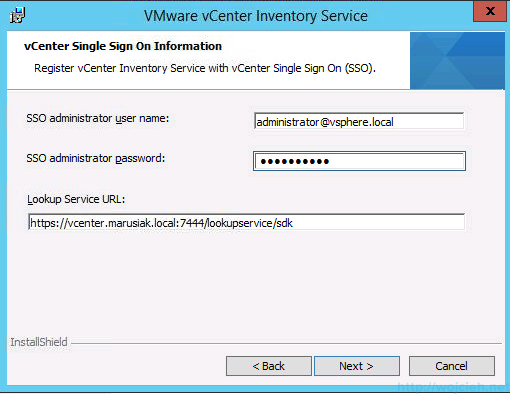 Enter vCenter Inventory Service URL (if changed before) and click Next. Change the location of vCenter Server binaries to a different drive than Operating System. Accept or not participation in CEIP and click Next. 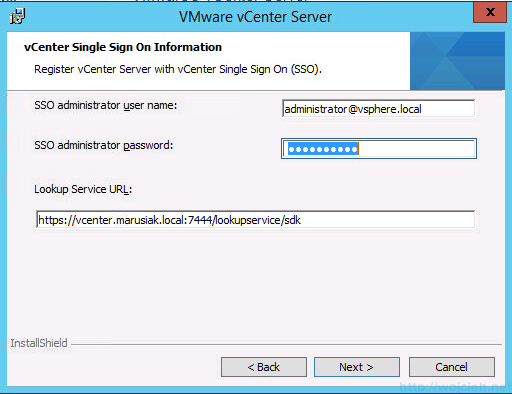 After successful installation, I changed all VMware services to use ap-vcenter credentials. If you plan to use application user as I did, don’t forget to add your application user to local administrator group or grant this user administrator rights on vCenter Server. 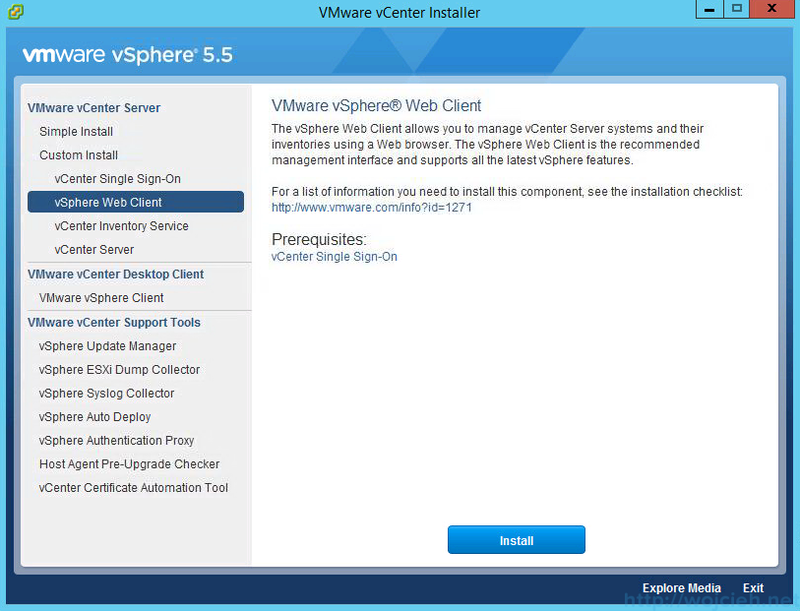 Open vSphere Web Client or vSphere Client and connect to vCenter Server we just installed. 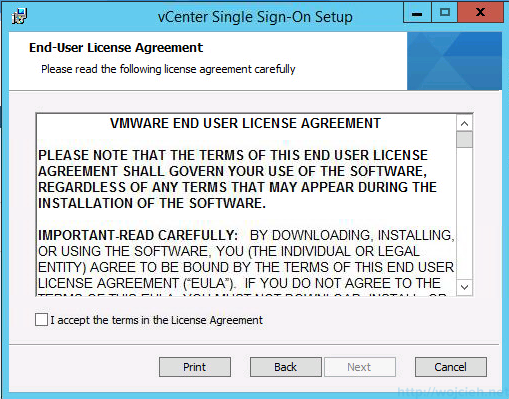 This concludes the installation of vCenter Server 5.5 with Microsoft SQL Server 2014 on Windows Server 2012 R2. Thanks for the detailed procedures. 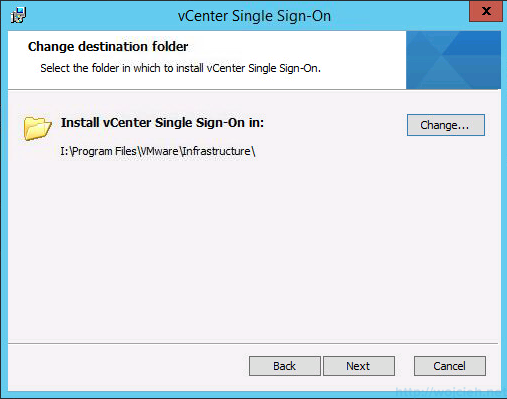 Did you install your vCenter with SQL at work? Is that your recommendation? Can you discuss a little bit about sizing and capability of this setup. I am very impressed by SQL 2014 and vCenter 5.5 is a superb product. Now, how do you feel about sizing single server vs. separate SQL & vCenter. 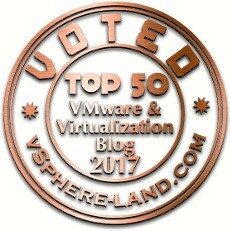 Thank you for any opinion.